Take a step by step approach to saving water in your landscape! Use the links below to scroll down to any of the water conservation sections. How should I water my landscape? 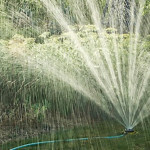 Although sprinklers allow you to water deeply, they often reach areas that don’t need water, and excess water runs off. water too much. 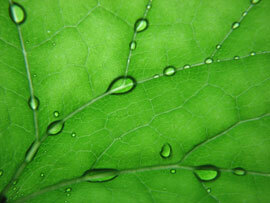 Excess water runs off the area, or through the soil past the plant’s roots. water too little, and the plant dies. water when it’s too hot, and surface water is lost to evaporation. Water early in the morning on hot days to prevent this. water when it’s too windy, and lose water to wind spray and evaporation. plant non-native plants that need constant summer irrigation! Create Healthy Soil – add Organic Matter! help clay soils soak up water. help sandy soils retain water. Helps plants take up the moisture and nutrients they need from the soil. Helps aerate (add pores and small channels to the soil, so air, water and nutrients can move through it easier) soil. Reduces compaction – this reduces runoff, increases microbial activity, allows roots to grow deeper and increases nutrient utilization. Avoid using leaf blowers – they compact the surface of the soil making it difficult for water to soak in. 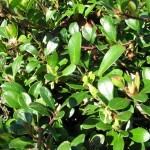 Kinnikinnick grows well in dry, sunny areas, and helps prevent soil erosion on slopes. You can save time, effort and lots of water by making sure you place plants in the right area! Learn where you have different micro-climates (an area or zone, which can be several square miles, or as small as a few square feet, where the climate is different from the regional average.). Planting the right plant in the right place will make for a healthier plant. Healthier plants fight off disease and pests better. Plant densely, prune and weed regularly, as needed. Place high water-use plants near one another. For instance, if you have a lawn, place annuals and high water-use perennials nearby so they’ll get watered more frequently. Check out our Native Plant Database for detailed information on over 50 native groundcovers, shrubs and trees! Each listing will tell you the plant’s light and water requirements, mature size, wildlife supported and more. Plant Native plants How do native plants help us save water? Native plants need much less watering and support beneficial wildlife. Native plants have evolved here with our wet Winters and our dry Summers. They are also adapted to the soils of this region. What this means is that once they are established after a year or two, there is no need to water them. Imagine the plants in the forest – nobody is out there watering them! If you have any questions about native plants or how to care for them, contact us! Organic mulch saves water, suppresses weeds and breaks down into beneficial nutrients. 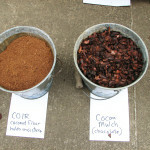 Mulch moderates soil temperatures, keeping the ground temperature more stable. It also helps prevent weeds, adds nutrients as it breaks down, and retains moisture on dry summer days! Organic mulch (from plant materials – bark mulch, compost, hazelnut shells etc) is generally better than inorganic mulch (such as rocks). Watering by hand often only wets the surface of the ground. Hand-watering usually only wets the surface, which can lead to shallow root systems. Sprinklers allow you to walk away and water deeper, but you almost always end up watering areas that don’t need water – encouraging weeds and contributing to runoff. Drip irrigation / soaker hoses deliver water right to the root system. They produce minimal evaporation, reduce weeds and encourage a deeper root system. Plant densely (don’t leave open ground), prune and weed regularly. Check drip system for proper function and coverage. No matter which device you use – utilize a timer! Early morning (or in the middle of the night if you have a timer) are the best times to water. The water bureau recommends watering in the middle of the night instead of first thing in the morning so we avoid the morning shower rush. Makes sense – if we are all watering our landscapes at the same time that many of us are showering it can really put a drain on the City’s water system! To water the most efficiently, keep an eye on the “weekly watering number”. The Weekly Watering Number is the amount of water in inches that your lawn will need that week. You can also use the Weekly Watering Number for watering other types of plants, by using these general guidelines while getting your plants established. Shrubs: 50% of the Weekly Watering Number. Perennials: 50% of the Weekly Watering Number. Vegetables: 75% of the Weekly Watering Number (new starts may require more water). Know your weekly watering number! Bookmark this website to learn more and to keep a close eye on the weekly watering number. 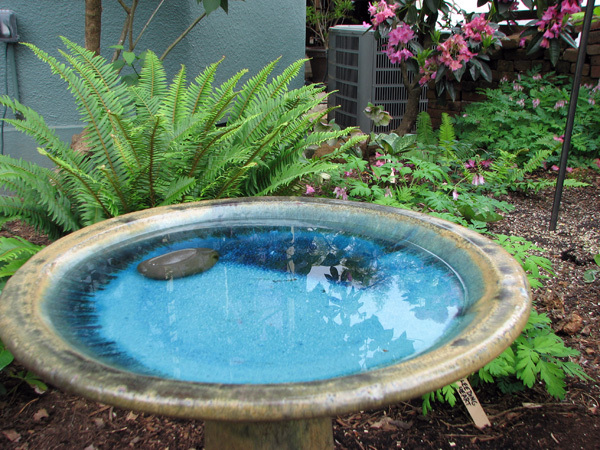 Learn how to save water and time in your yard! We offer free workshops every spring and fall. 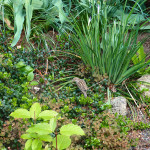 Learn about the benefits of naturescaping, how to build a rain garden, and more!